Protein-rich eggs and creamy, nutritious avocado go perfect together for breakfast or brunch. The dish can be made in a skillet or baked in the oven. I first discovered it thanks to one of my weight loss management patients who tried and liked a recipe she saw on The Chew. 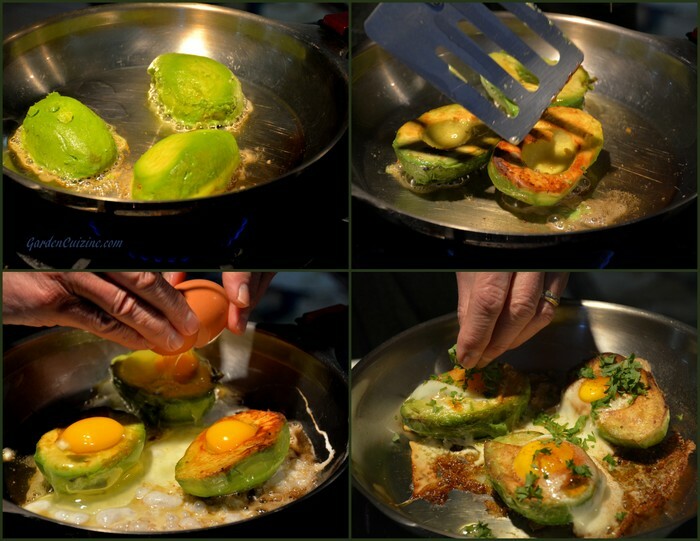 Some cooks prefer to bake the egg in avocado with the skin on or some prefer to remove the avocado skin first and cook the egg and avocado in a skillet. We found that the egg whites did not cook through in the skillet since they were suspended by the avocado. So we removed the avocado skin and did a combination cooking method that browned the avocado in an oven-proof skillet first then finished and cooked the egg in avocado in a preheated oven. This ensured the egg to be food safe with the raw egg whites completely cooked. Carefully slice around the avocado, cutting each avocado in half. Using a large spoon scoop out the avocado away from the skin - try not to break it. Remove the pits. In a large oven-safe skillet, add a little olive oil and heat over medium high heat. Add the avocado halves sliced side down. Simmer until golden and gently flip using a spatula. Crack an egg into each half, sprinkle with paprika, season with salt and pepper, and finish in a preheated 350°F oven. Garnish with fresh herbs from your garden! Optional accompaniments: pan seared Canadian bacon and toasted bagels, whole grain bread or raisin bread. Avocados contain other nutrients including 25 milligrams beta-sitosterol (plant sterol) per 1-oz. serving. Plant sterols have been scientifically shown to help maintain healthy cholesterol levels. Blog post and photos Copyright (C)2014 Wind. All rights reserved. Note in the photo I only used 1 1/2 avocados not a full 2 as the recipe calls for since we were just serving 3 people this morning.